“How do you know they’re from downtown?” I asked. “Oh, you know!” he said. Our sidewalks on Broadway are full, not just of hipsters, but runners as Riverside and Central Parks were closed and the marathon, cancelled. But we uptown people can take all comers. The Upper East and West Sides are big tents: bigger than this year’s political parties in that we can seat all migrants at our tables in our kitchens or in our restaurants. I coped with the influx of downtowners the way I coped with my helplessness after 9/11. I went downtown to see a show. 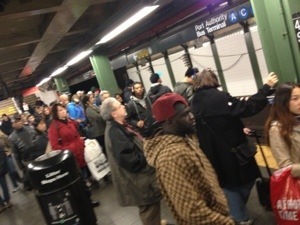 Subways back in service at 42nd street. Yesterday Chris and I traveled via subway to Tribeca to see Heresy by A.R. Guerney at the Flea Theatre. So good. This political play takes place in a military office stocked with a bar and characters who believe various degrees of American exceptionalism. 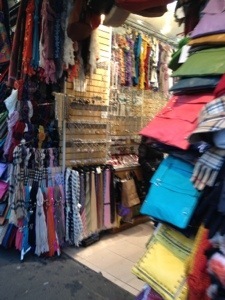 Shops were back in business in Chinatown. the reality that frustration with #1 and 2 leads to violence. Karen Ziemba was hilarious and Annette O’Toole was heartbreaking. It was great theater and a needed escape from the crowded streets of the Upper West Side.